Media tycoon Kalanithi Maran, 49, and his wife, Kavery Kalanithi, have retained the top two slots among the country’s highly paid executives. In 2013-14, their pay was Rs 59.89 crore each, including salary, perquisites and other allowances. According to BS Research Bureau data, the next was Pawan Munjal with Rs 37.88 crore. According to Sun TV’s 2013-14 annual report, Kalanithi Maran, executive chairman, drew Rs 13.1 crore, and perquisites and other allowances of Rs 46.7 crore. Kavery, executive director, got the same package. In 2012-13, husband and wife took Rs 112.4 crore together, including Rs 13.4 crore of salary, and perquisites and other allowances of Rs 42.8 crore each. A year before that, it was a combined Rs 114 crore — Rs 10.8 crore of salary and Rs 46.1 crore of perquisites and other allowances each. 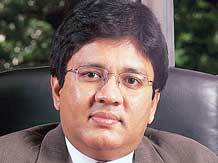 According to Forbes magazine, Kalanithi Maran’s net worth is around $2.3 billion. He’s ranked as the 23rd richest person in India. His Sun Group has business interests in the regional television market, with 33 channels across four regional languages, reaching 95 million households in India. This makes the group the largest TV chain in the country. The market capitalisation of Sun TV was Rs 13,791 crore, according to the BSE exchange. Sun Group’s other business interests include direct-to-home-television, 45 FM radio stations, two daily newspapers and six magazines. Last year, Maran acquired Hyderabad’s Indian Premier League cricket franchise, naming it Sun Risers. The Group also owns a major share in the SpiceJet airline.